Today while at a workshop over at the Lifeway Brown Bag Lunch-n-Learn this morning, I learned a great trick to prevent running out of our stockpile items. One of the biggest challenges I face is getting my family to let me know when we are almost out of an item so I can put it on my shopping list. I won’t say how is the biggest offender. (Hint: There is a clue in the picture above!) I typically get a “we’re out of body wash”, when we are already out. I prefer to know when we have one bottle left, so that leaves me plenty of time to find it on sale before we run out. A huge thanks to Alice for this great tip! 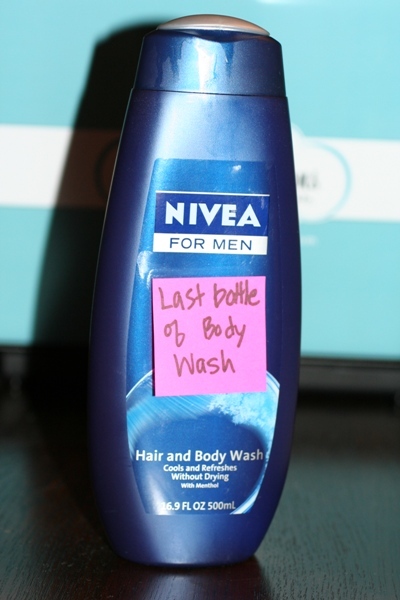 Label the last (or second to last depending on the product) of an item in the stash with a post-it with something like “last bottle of body wash” written on it. When someone takes that from the stash they can leave it for you in a convenient place such as your bathroom mirror, the fridge or the family calendar. Where ever works for you and they will actually put it. Sometimes the post-it needs a little helper tape or rubber band to stay on the product. We’ve been using this system for a long time and it works like a charm. Haven’t had a “we’re out of shampoo” in forever. Do you have a great tip you’d like to share? Email me any tips you use to save money or stay on track in your budgeting to kelly (at) faithfulprovisions (dot) com. I have to laugh at this particular example because it will be a VERY VERY LONG time before we run out of body wash – – I finally had to stop taking advantage of every free body wash offer through CVS, Walgreen’s, etc. We have MORE than enough – – I really need to donate some of these bottles! Especially the massive supply of MEN’S body wash…….. This is a very good idea! Thank You!